Get fairness that doesn’t shine, this is Garnier face powder’s tag line. I got mine in 01-Ivory tone. After the reviews that I have read about Garnier’s anti-eye bags roll on, I got curious about how well their face powder would deliver. When I saw how cheap it was, this one time I was in the mall in search of some pretty discount rugs (swinging by a mall’s beauty section is almost always a given :-P), I couldn’t resist wanting to try it out. By that time, my ever favorite T.LeClerc in Yellow Banane was officially going to say goodbye in a few touch ups. I thought it would not hurt to try a cheaper brand that has received a few good reviews, right? Plus, T.LeClerc is only available in Rustan’s and I was totally in the wrong mall to go look for one. I think I like Garnier’s face powder more than Palladio’s Natural Rice Powder, which is a little more expensive than the former. 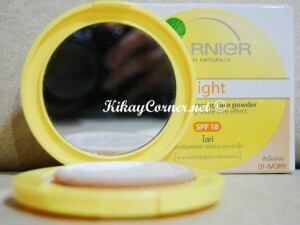 Garnier Light visible whitening face powder provides whitening effect and a 6 hours shine-free look in an ultra-light texture.